Sometimes you discover what you already knew. Maybe it was the way the keys looked up at me like a broken tooth smile, or maybe it was its dry, dusty look of a dream left for dead. I can’t tell you for sure what made me wake up when I saw her sitting there. The typewriter. But I knew it was meant for me to see. And it was meant for me to know what it meant, when I saw it. Saw her. For years and years, actually my entire track record of adulthood, is littered with the ashes of the “next big thing” I was going to do. When I lived in NYC, first an actress, then a filmmaker and eventually a producer. I never could really ground myself to one absolute direction. Or at least I thought. Fast forward to my years here back home in Rhode Island and that track record is just as notable. Lots of stops and starts. A personal trainer. A digital marketing guru. A graphic designer. A web designer. Apparently, I could do it ALL. It was the same story I had always told myself. In the midst of all this I had (and continue to be) day job committed. You know what I mean. The place you go from 9-5 but your heart isn’t always in it. I’m lucky enough to have some shining moments, but they are fleeting. And I’m one of those people that want to do more with this life. The money motivation is missing from my DNA. For me it’s all about doing something meaningful. Creating something. Leaving my mark and helping others leave theirs too. And although that doesn’t sound like a bad way to think, it can derail your direction if you can’t determine the one thing that will get you to the goal. It was that exact train of thought that always got me in trouble. Always brewing the secret sauce of “you need to do something else” and “you have a gift, use it”. Up until recently, that secret sauce was brewing and still feeding me all sorts of misinformation. But then last month, we went to Arizona on a college visit for my stepdaughter. We were doing the tourist thing and tripped through a tiny little ghost town attraction. And there she was. The typewriter. Smiling at me. I took the picture with my iPhone, looked at the image staring back on my screen…and in an instant, I KNEW what I had always known. And even as I write those words, tears well up. To suddenly know, in every fiber of my being, for the first time and with complete clarity who I am, is emotional. It’s especially emotional because I have always BEEN a writer. Through my 12 year journey in NYC, the one thing I did constantly? Write. I wrote stage plays, screenplays, monologues, short stories. I wrote for local trade magazines. I wrote for company newsletters. I am a published poet for goodness sake. When I skip my brain forward to my time here in RI? Writing. I wrote articles for health and wellness magazines while I was busy thinking I wanted to be a personal trainer. I wrote corporate wellness video scripts. I wrote marketing content for my “day job”. I have ALWAYS strung words together. It is the one thing that brings me abundant joy and peace. So that leads me here, to you, telling this story. Why does it matter? Because when they say, “sometimes you need a sign”, they aren’t kidding. 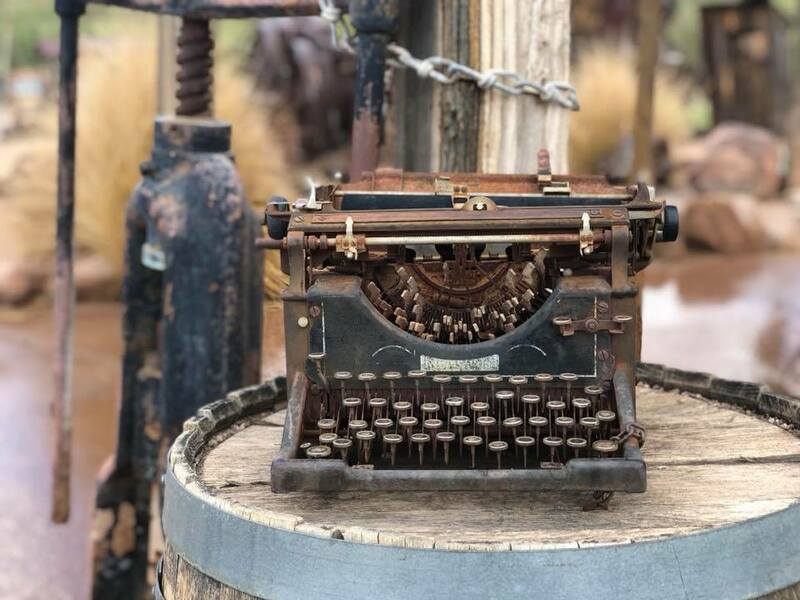 That dusty old Arizona typewriter was waiting for me. Waving invisible hands and yelling “Over here! Over here!” And I came on over and now everything has changed. I know my path, and it has led me here. To help others find THEIR story and to help them tell it. This picture is not just of a typewriter, but of something I always knew but somehow forgot. I am a writer. That’s my job in this big ole world, and so I have begun.